Wassup! : Rock Star exercises and pampers your pup! If you live in Seattle, that is. 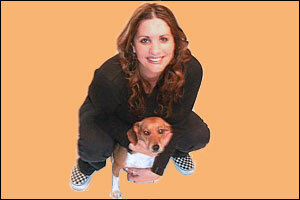 My pal Northwest hitmaking girl band The Hot Rollers' vocalist/bassist Lori Campion, also an animal welfare advocate owned by her sweet and special beagle, Lulu, runs a brand new eco-friendly dog walking service, Seattle Green Dogs! Quite honestly, I have never seen any green-colored dogs around her place (she's a neighbor). But she's a conscientious environmentalist - like most of us around the Northwest - so she makes sure your pup gets the best food and treats (or you can provide your own), all pet processing products are "green," and that your hePet, shePet or theyPets not only get a good workout but she buffs the mud and dirt off her four-pawed clients after a vigorous play time so they're delivered back to you happy, healthy, fluffed and polished. Seattle Green Dogs crew members include a dog behavioralist who can help with any training issues or behavior problems your pet might experience. Lori's a great person and animal caretaker. You can bet your pet will be met with great care without going into debt at her doggie exercise service. Um, to be clear, I'm posting this to help dog owners looking for such a super service that uses all green products and practices because I know, adore and trust Lori with my beloved pets - I've seen her in action; I'm not receiving anything for telling you about Seattle Green Dogs. BTW, Lori and Lulu proudly point out that the first ever beagle - Uno - took Best of Show at this year's Westminster Kennel's Dog Show just yesterday! They reportedly wept and bayed openly as the hammy, crowd-pleasing Uno scooted around the ring to a standing ovation.